Meet Samuel P.N. Cook, a US Army Veteran and high-end marketing consultant (the marketing is a recent thing). Sam served in Iraq and helped solve war problems… but he didn’t do it with guns. Despite leading 140 soldiers with 9 tanks, 13 armour cavalry fighting vehicles and 10 snipers, Sam used storytelling and persuasive writing techniques to accomplish his mission. And in the process, he saved thousands of lives. As Gary Halbert says, there is no problem in the world that can’t be solved with a good sales letter. In this episode of the Email Marketing Podcast, Sam tells his story. What were the magic words that caused 187 people to turn themselves in and stop antagonizing the US Army? Speaker 1: You meet them at the story they’re living and then you write the ending. Hey podcast listener, you’re about to discover insider tips, tricks and secrets from making more sales and converting more prospects into customers with email marketing. For more information about the email marketing podcast or the Autoresponder Guy, go themcmethod.com/podcast. Hey everybody, it’s John McIntyre the Autresponder Guy. It’s time for episode 13 of the email marketing podcast where we talk about the top tips, tricks and secrets for making more sales and growing your revenue with email marketing. Today I’ll be talking to Sam Cook. Sam’s a high-end marketing consultant who got his start in marketing. Somehow that’s not very trivial, the war in Iraq. Sam served in Iraq and helped solve war problems but he didn’t do it with guns. He had 140,000 soldiers with nine tanks, 13 armored cavalry fighting vehicles, 10 snipers. Despite all that, Sam used story-telling and persuasive writing techniques to accomplish his mission and in the process he saved thousands of lives. This is a bit of a different episode. It’s not just some straight up tactics. It’s a bit of a story of what Sam did in the war and how he used storytelling to get the mission done. What we’re going to talk about in the process is how you can apply that to email marketing. He’s a big part of marketing. It’s just telling stories and just finding ways to communicate ideas through stories. This is a fantastic episode. I think you’re going to really enjoy it. As Gary Albert says, there’s no problem in the world that can’t be solved with a good sales letter. That’s exactly what’s going on here. Sam wrote a letter, solved some problems and just incredible what you can do when you can communicate with copywriting. To get the shownotes for this episodes of the email marketing podcast, go to themcmethod.com/ep13. Now there’s just one last thing before we get started. Next week in seven days, there will be no episode. I’m off to Europe for trip. It’s like a conference-camp with Simon Black, Ray Valentine and a couple of other guys. While I’m there I’m going to try and get a podcast episode done so we can find out how they do email marketing. I’ll see how I go there but rest assured that I’m not stopping. 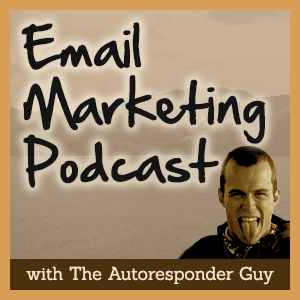 I’m going to continue with the email marketing podcast. I’ll be back a week after two weeks from now with Ezra Firestone with an episode on email marketing for e-commerce store owners. That will be a great episode. Now let’s go talk to Sam Cook and find out how he sold ideas to police chieftains and all these kinds of guys up in Iraq and save lives in the process. It’s John McIntyre here. The order is from the guy. I’m here with Sam Cook, a friend of mine. Sam does high end consulting for clients where I met him recently at James Franco events in Sydney a couple of weeks back. When I met Sam, we talked about some very interesting stuff he’d been doing in a previous life. Sam had been in the US army, had served in Iraq and he used some very interesting strategies to achieve the goals of the mission like pacifying the area in ways that you wouldn’t really expect from a soldier. He never really thought he’d write stuff in the army as a mission. He thought he needed to do more like normal soldier stuff like shoot guns but he ended up using skills that turned out to be really relevant to copywriting and marketing and writing emails and today that’s what we’re going to talk about because I think there’s a ton of value that we can all get out of this and especially when it comes to stories and understanding. It’s fundamental stuff, telling stories and understanding exactly what your target prospect wants. That’s what we’re going to talk about today. How are you going today Sam? Speaker 1: A good job, how are you? Speaker 2: Fantastic mate. I think that’s a generalish introduction. Let’s step back. You’re a high end consultant but used to be in the army. Give us a little bit of a background on how a US army soldier over in Iraq gets into copywriting and marketing? Speaker 1: Yeah, John. It’s definitely not the most conventional background for sales consulting at the Army but I’ve always been when I was in the army, I actually majored in history at West Point. History, you take out the ‘hi’ and it’s just story. From the ancients, the first historians were amazing storytellers. I grew up since a small child being interested in history which is why I ended up going to West Point and studying history. My background’s always been in writing, reading and writing but in 2005, I graduated from West Point in 2000. In 2005 I did my first deployment to Iraq as a captain and in that deployment I was involved in the famous Tal Afar campaign which President Bush cited in a speech he gave in 2006. When the war was very unpopular, he cited the Tal Afar as an example of success in counter-insurgency. My commander at the time was Colonel H.R. McMaster who’s now a Major General in the US Army and he was widely recognized as the most talented successful commander in Iraq that the army had seen. The way I knew that was I didn’t have a typical job on that tour. Most people think of going to combat and you have a bunch of soldiers in guns and as an officer you’re out there kicking in doors and shooting and chasing bad guys. I wasn’t doing that. There was plenty of that going on in that tour but I was a staff officer. My job was to literally follow the Colonel around, keep his schedule, make sure his vehicles were ready when he wanted to go out on a patrol and make sure his helicopters were ready whenever he wanted to fly around to different areas. That was a really interesting time because I was forced to just watch and most officers during that campaign were doing things and I was just watching what turned out to be a very historic moment in the Iraq war history which was the first successful counter-insurgency strategy where a large area in Iraq was pacified and Tal Afar at the time was a city of 250,000 people. It was one of the most violent in Iraq. One of the other jobs I did for the Colonel was I wrote his letters for him. I had to write all of his correspondence for him, he got a lot of fan mail and I had to deal with journalists. We had Lara Logan from CBS, Mike Heller from CNN, Tom Roberts from PBS and all the top journalists from the US ended up coming over to see Colonel McMaster. They were all looking for the story. As the Colonel’s adjutant, I was working with the public affairs officer to help them find the right place on the battlefield to tell the story. War especially as it’s happening is very chaotic. It was very interesting for me to see how people told stories based on what was happening. They take a very thin slice of what was going and they’d tell a story that sold well in journalism. I guess I just learned that the feat of the best storytellers out there were journalists and I watched Colonel McMaster tell them a good story, his interpretation of the events and then I watched more importantly Colonel McMaster tell the Iraqis the story that he wanted them to hear which was why they should side with the United States versus working with Al Qaeda because there was a big struggle there with the local Iraqi forces where on the US Forces side but then a large portion of the population didn’t like the US and our primary competitor over there was Al Qaeda and Iraq. Speaker 1: That was my first tour and when I went back my second tour, at this time I was a commander. I had a year and a half to prepare for the second tour in 2007 when I went back. It was the surge where Iraq still was getting worse despite what happened in Tal Afar in our area. Most of the rest of the country was still pretty bad and I was going to go back into that and I remember training my soldiers very, very diligently for high scale combat operations. I had 140 soldiers, nine tanks, 13 armored cavalry fighting vehicles, Bradley fighting vehicles and 220 mm mortar tracks, 10 snipers. I had the whole kit I guess as you’d say. Every boy’s dream, right? We all played soldier growing up and I had the ultimate arsenal and firepower and I expected when I went over there to be in a pretty intense situation and I actually … we were in a very tough area when I went there in Shawkat and Shawkat was south of Mosul in the Northern Tigris River Valley area. When I went there however, one of the first things that we did was we wanted to secure the neighborhood next to us which was supposedly full of Al Qaeda sympathizers. One morning, we did a large raid and surrounded an entire neighborhood, went and searched the entire area and we were looking for two guys that were supposedly bad and we didn’t find them which happened more often than people like to admit. When you see the movies they always catch the bad guy but just like copywriting I guess you write a lot of emails that don’t work and then one hits. We went in this raid and when I came back, we had a local leader, a Sheik from the local tribe came to the gate of our combat outpost and we lived in the middle of the town, just me and my 140 soldiers. Speaker 1: My insurgent or my interpreter. Sorry, not an insurgent. My interpreter got the letter and he read and my executive officer Captain Matt McKee, he came up to me and said, “Hey, sir. This guy wrote us the letter.” He said all the kids missed school today, none of the men got to go to work. They all missed the bus to work and they’re not real happy about it. He sat down with my interpreter and he said, “Hey. Sorry about that but this is why we did this. We were trying to get this guy that we heard was really bad. We wanted to keep the neighborhood safe.” What was really interesting about it, we wrote it in Arabic obviously. In fact he was in tears. Men over in Iraq I found were very emotional compared to Americans. It hit me and I thought wow, that’s pretty interesting. You sit down for 30 minutes, you write a letter to someone based on their concerns. This guy who runs the neighborhood next to us is on our side now. He’s not shooting the bad guys for us but he might tell us about it now. This was in December of 2007 and around our Christmas time. My soldiers were getting ready for Christmas and the Eid festival was coming up, which is a Muslim feast of thanksgiving. Speaker 1: I sat down and like a copywriter sitting down, I was thinking for a while what do I say? All of a sudden I realized we have this very important Muslim festival coming up, how about I sit down and just with people a happy Eid festival? I sat down and I said, “Okay. All right, I’m going to write a one page letter because I wanted to keep it to one page,” and said, “Okay. Here’s a summary of it. In the name of God Most Merciful,” which is how they address everything they say over there because they’re all Islamic or Muslim. We needed a break at that time anyway because I had been running my soldiers like crazy for every night since we got there. We were on a mission. They were pretty tired anyway. Then I said, “But the reason we’re still here is because we’re trying to fix the problems in Iraq and my soldiers, some of them are here for the second and third time. They don’t want to be here either but we have this obligation to help you guys. The Iraqi government which we’re trying to build so that we can leave is standing up and Al Qaeda is fighting them,” and Al Qaeda was doing a bunch of attacks and suicide bombings in the marketplace the year before they had killed 30 people. A lot of women and children with the suicide truck bomb in the marketplace. Really, it was just as I said, “I’d like you to end up joining sides with us.” Really, it was just a very simple clear acknowledgement of their situation and how they felt which was anger towards the United States and then telling them why we were a better option than the other option out there to solve the problem which was their number one fear was lack of security and what kind of world are their children going to grow up in. He read it and the local police chief was not actually … we knew this from intelligence, he wasn’t a fan of the United States. He’d actually been suspected of … actually he was best friends with the leader of the insurgency and they were childhood friends. He immediately took the letter, he yelled at his policeman to go make copies of it on the local copy machine and this is back in 2007. I think Mark Zuckerberg had just started Facebook the year before. They didn’t have that in Iraq but now they do. What happened was, he took the letter, made a copy of it and he told all the policemen to go out and drive it to the local mosques. It was like a Sunday, right? Everyone in here even if they’re not in the mosque praying, they hear it from the local neighborhood and what we used to do is we would go listen to the mosque broadcast and see which imams are saying bad things about Americans because if then we knew that there were some attacks coming. This guy ended up ensuring that all the local imams not only didn’t say anything bad about the Americans but they read my letter to the local population. I’m telling you, the effect was electric and I actually had gotten overtures from some of the leaders of the insurgency and I wrote them letters too. They wanted to sit down and talk with me. After this, I ended up meeting with two leaders of the insurgency who were the highest ones and I remember talking to them and this was very controversial because a lot of people said why are you talking to guys who had been trying to kill us? I sat down and I spoke to my commander about, Colonel Dorman. He said, sure go ahead and do this. When I sat down and talked to the leaders in the insurgency, the first thing they said was thank you for the letter, not only the letter to them but the letter to the people. I ended up getting a lot of valuable intelligence from these guys who were tired of fighting and just wanted to talk with someone they felt was reasonable who they could trust. Then the couple of the months after I wrote the letter, everyone I said, said, “Hey, thank you for this letter that you wrote to me.” They would pull it out of their pocket. I guess everyone got a copy of it somehow. They would pull it out of their pocket and say … they’d talk to me as though I had written it to them which I know is really funny because I just written it to the local people but I guess I had written it in such a way without even knowing it that email copywriters teach which is write it as a personal letter. The effect really was a deep sense of rapport with the local population. What ended up happening was there was one of the first organized surrenders in Iraq occurred two months after I wrote the letter where I think 187 people turned themselves in. Speaker 1: They basically came in and admitted. They didn’t tell me specifically what they were doing but they admitted to being anti-American in thought, word or deed or all three. They submitted to biometric screening. All their stuff is in the Transportation Security Administration database. Their fingerprints, their eye retinal scans and then they basically promised not to do anything else against the US, tell us what they knew and we brought them all in and interviewed them one by one. We also had someone like their father or a Sheik guarantee them. If they did anything wrong or ran away because we were supposed to be able to talk to them whenever we wanted, then we would arrest their guarantors. Instead of bail like money, we had a human bail which actually turned out to be much more effective. That was really a very powerful impact and my soldiers really didn’t necessarily like the letter writing I did because it would mean they didn’t get to shoot as many guys and kick in as many doors. We did a lot of raids. We had a couple of pretty large firefights with some pretty bad guys. That actually as a result came from one of the insurgent leaders that we met with told us where to find one of these guys who ended up being one of the worst insurgent leaders in Northern Iraq. It was just a really powerful illustration to me of doing something I never thought I’d do in a situation that you’d never think that you’re going to sit down and write something but it ended up being the best 30 minutes I spent in Iraq was sitting down and writing a simple what you call a sales letter. Speaker 2: Absolutely man. The reason I love this story … we’ve just gone 20 minutes of that story and that’s pretty much an episode right there. We had talked about this just a little bit longer to wrap up with the personal lessons and I’m just reminded of Gary Albert who said once that there’s no problem in the world that can’t be solved with a good sales letter. I think you’re saving some of the biggest problems out. You’re saving lives with a frigging letter. People are skeptical whether an email marketing works or not. The proof is right there. It’s just the same, you wrote personal letter. Some of the stuff of though, I’ll try and summarize and tell me if I’m missing anything here than number one, you understand your subjects. You understood what the Iraqi people wanted, what they needed, what they really cared about and then you understood their fears as well. You knew what they wanted, you knew what sort of life they wanted to have and you also knew what they were afraid of. Then you used, you wrote a personal letter, that’s a key thing there. You write it like a person and basically weave the whole story into it. It just connected and just resonated people. I think it’s incredible. That’s the main stuff, right? Is there anything I missed there in summing up the lessons? Speaker 1: Well, I think a couple of things is President Obama, it really reminds of a political war according to Clausewitz is politics by other means and President Obama ran the most successful internet based campaign in history in the last election. President Obama is the least qualified and I don’t say this in a political way but the facts are he’s done the least amount of public service work before any president in history because he’s young. He was only 47 when he was elected so you can’t fault him for that. He told a great story and when you watch a political campaign, you look at it and it’s very confusing as it’s happening. The night after the election, all the pundits will get on and say, “Hey, well this is why President Obama won,” and then they’ll make a neat little story out of it, right? Speaker 1: Which is funny because during the campaign you don’t see that story and war’s exactly the same way. In combat, in Iraq, it’s very hard to see the story as you’re fighting it, as you’re living but what I learned watching the best in the business, Colonel McMaster was if you could figure out and I watched him do this in a number of meetings. If you could figure out a way to tell a story real-time what people are seeing, so you take the madness and chaos and the fear and the emotions that they’re feeling and you attach meaning and a story not only of how things are but how they will be. That’s how you win, is you tell a story of how things should be. You meet them at the story they’re living and then you write the ending. Speaker 2: I love that. That’s incredible right there. Say that one more time. Speaker 1: You meet someone in the story, the chaotic hellish story that they’re living and then you write the hero’s journey conclusion for that story. Speaker 2: Fantastic. Arguably that’s probably the best thing to end on right there. Thank you for telling the story man. This has been awesome. I think it’s a bit of a different episode. Let’s finish up, tell people to I guess a couple of sentences about what you do and where people can find you. I know you’ve linked me to a couple of news articles which I’ll put into shownotes for this episodes. Yeah, just before we go just tell people where they can find you and will contact if they want to hear more or learn more about what you’re getting up to. Speaker 1: I’m working with clients but the article you mentioned was from a book by Tom Ricks in the bestselling book on Iraq called The Gamble. It’s not necessarily the story of the letter but there’s a story of the unit and what they did there. It’s probably the better way to get in touch with me. I would just say that if anyone has any interests in talking to me, I’d love to swap war stories or whatever but I’m full up right now with clients. Speaker 1: But I love to hear back from people and especially other copywriters on ideas they have. Speaker 2: Absolutely. Well, all right man. Thank you and thanks too for the service in the army too for keeping our country safe. Speaker 1: Well, thank you John and I really appreciate your newsletter. It’s funny, I didn’t know I was doing all the things you said I should’ve been doing but as I read your … go through your video course which is awesome by the way and your McIntyre method course and also listen to your podcast while I’m running. I start to understand just some of the truths that a lot of us intuitively know about email marketing that we just apply but then we don’t know we know it. What really stops us is just not sitting down and writing the damn thing like you say. Well all right, man. Well thanks again, thanks for your time and we’ll see you soon. Hey everybody. Thanks for listening. If you want to discover more insider tips, tricks and secrets about driving sales about email marketing, sign up for daily email tips from Autoresponder Guy. Go to themcmethod.com/podcast. Sign up and type in your email address and I’ll send you daily emails on how to improve your email marketing and make more sales via email. You’ll find out why open rates don’t matter and the seven letter that underlies all effective marketing and much more.